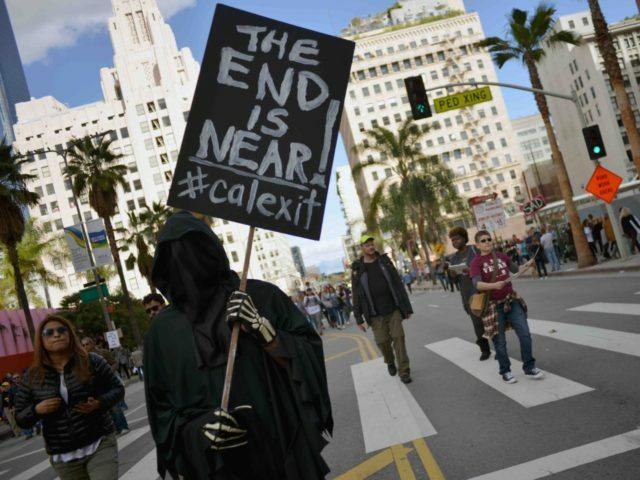 For the second time in less than a year, the CalExit effort in California will gather signatures for the right to secede from the United States. The state attorney general issued an official ballot measure title and summary Tuesday. The campaign can now start gathering the more than 585,000 signatures it will need to qualify for the 2018 ballot. The initiative would form a commission to recommend avenues for California to pursue its independence and delete part of the state constitution that says it is an inseparable part of the U.S. The measure would also instruct the governor and California congressional delegation to negotiate more autonomy for the state. This will be the second attempt to put a secession measure on the 2018 ballot. The first attempt failed, and was subsequently withdrawn from consideration in April. The original initiative was clouded by rumors of Russian involvement and irreconcilable differences among leadership. This latest initiative, which will be titled “California Autonomy From Federal Government,” according to Becerra’s press release, must gather 585,000 valid signatures to qualify for the 2018 ballot. The proposal, scaled back from an initially more aggressive version, would direct California’s governor to negotiate more autonomy from the federal government, including potentially putting forward a ballot measure to declare independence. The initiative wouldn’t necessarily result in California exiting the country, but could allow the state to be a “fully functioning sovereign and autonomous nation” within the U.S.